On arrival in outskirt of Ben Tre around 10:00 am after 2 hours driving from Saigon. We start biking from a small ferry to Cai Mon and Cho Lach. Ride through village amongst coconut gardens, nurseries, ornamental gardens, and fruit orchards. Lunch en route. We continue our cycling on dirt track to Binh Hoa Phuoc village. Relax on boat and see activities of local along the Dong Phu canals to home-stay on the Island of An Binh. Thang and Loi was fantastic and it was wonderful to see so much of the rural area that we never would have been able to see on our own. Thang was knowledgeable and kind and funny and answered all of our questions, and he took extra time to show us more based on our interests. I would love to come back and do it again. A thoroughly enjoyable tour. Thang were an excellent guide. Very friendly, informative and helpful. Loi, our driver was an excellent. One suggestion- A local map showing the town and village on the tour would help. We enjoyed the tour very much and we enjoyed riding a lot. As we were only a group of friends, the trip was very flexible. It would have been cheaperwith more participants. Dat knew alot to tell, This was great! We have an excellent dinner!! We love all the fruits!. A little disappoited about the floating market. I expected there would be much more boats selling their staff. Good mix between cycling and showing things, like rice fabric etc. We did a 2 day cycling tour of back roads in the Mekong. Our guide, Nghi, was incredibly friendly and helpful. He tailored the tour to what we wanted to see and do, and also how far we wanted to ride. Riding along tiny back roads really got us in touch with local life in the Mekong the routes we took were interesting and diverse, and we got to see local farms, schools and villages. The food was excellent! We loved eating at little local places that the locals also ate at. The bikes were great and our driver was also really helpful and ready to pick us up and whisk us off to the next destination. The homestay where we stayed overnight was also very peaceful and relaxing. I couldn't recommend this trip more. Thank you for providing such and excellent service, and being so helpful with the booking process. Cnr Genetics Ln & Royal Pde. All in all an excellent tour! Great to see local villages. Can see a lot more on a bike than on a bus. The boat trip was great too. Our guide was very friendly and helpful. We will recommend this trip to others. It was very worthwhile and a highlight of our trip. The homestay was lovely as were the places we had lunch and rest stops. Congratulations on providing a wonderful bike tour. We had a fantastic time in the Mekong Delta. Van and Loc were both great tour guides and the flexibility of the tour meant that it catered for the needs of the children really well. From start to finish we felt well cared for and could trust that we were in good hands. The hotel pick up was smooth, the drive to the Mekong was comfortable and fun. Lock provided a great commentary as we drove along giving us information about the city, people, culture and what we could expect from the tour. When we arrived to meet Van and pick up the bikes we were amazed a how organised you all were with the bikes labelled for each person. The safety information was clear and we were soon on our way. It was fantastic to head down a tiny lane way and explore the back roads of the area. We would never dare to venture into such unknown and strange places. Soon we were looking into the lives of the locals as we passed by people's homes and farms. We loved stopping for fruit at the road side stalls and tasting food we'd not trust ourselves to buy without a guide. The lunch venue was superb with much more food than we could eat. We enjoyed the afternoon ride and getting onto the really tiny streets and lanes. The river crossings made the whole experience quite an adventure. Our accommodation was great and an opportunity to make spring roles with the host was fun. We enjoyed the evening sitting outside but found the beds a bit too hard for our comfort. Breakfast was good with options providing something for different tastes. The visit to the sweet shop was an interesting experience for the children and we enjoyed tasting different treats. It was good to get back on the bikes again and continue our ride. When the youngest became tired a motor bike ride was a welcome relief. Van and Lock did not seem to find it any trouble to help out when needed and adjust the trip to meet the changing needs of the children. We also enjoyed the conversations we had as we rode along with both Van and Lock who were most informative and interesting to talk with. Some of us would have enjoyed being able to ride further, but needed to cater for other who got tired and were affected by the heat. The only real challenge on the journey was the heat. It meant we needed plenty of stops for drinks and it was challenging riding in the hot sun. 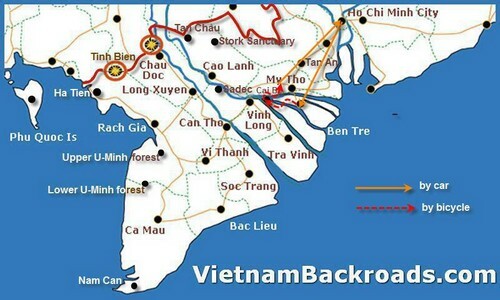 The only solution to that issue would be to come again in the cooler months to do another bike tour and discover more of the Vietnam backroads. PS I believe you've recently been married - congratulation!! We are now back in England. We thoroughly enjoyed our 2 day adventure and want to thank you for organizing. It really was the highlight of most of my family’s holiday. We felt very looked after and would like to commend our driver and guides. My family especially enjoyed Harry’s company and his commitment to making sure we were safe and having a very good time. We had no areas of complaint as everything was so good – bikes, itinerary, guides etc. The only tiny thing we would have changed is that we would have eaten lunch on day 2 in a local Mekong Delta restaurant to sample their food and hospitality however that would have been our personal choice and the lunch we had was very adequate.